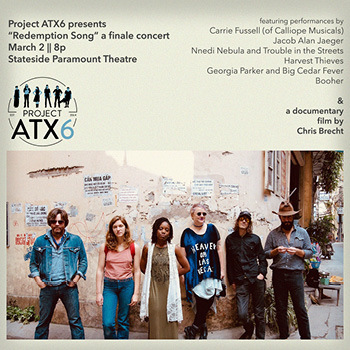 Project ATX6 is a music documentary project featuring six musicians in route to international music festivals. This finale concert will feature performances from the six Austin musicians that toured from Austin to festivals in Halifax, Montreal, and Hanoi. The film, directed by Chris Brecht, chronicles both the excitement and the disappointment each musician felt when they discovered that Quest Festival in Vietnam was canceled the night before their main stage performance. Following Vietnam, the ATX6 musicians toured to Montreal for a redeeming showcase at Folk Alliance International. The Project ATX6 Season 5 journey was long and each musician has an unforgettable story to tell. Don’t miss this farewell night of music, a documentary short, and probably a few knock-knock jokes.